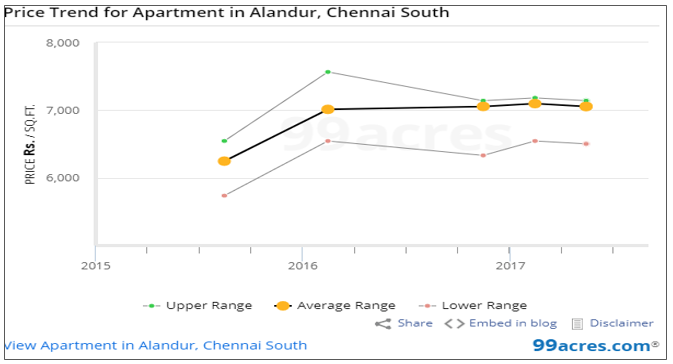 Despite Chennai’s sluggish growth trajectory owing to political and economic uncertainties, housing market in Alandur reported stability in Apr-Jun (2017). Infrastructure projects on the card, smooth connectivity and proximity to IT parks and industrial estates emerged as the key growth drivers for the locality’s real estate market. Housing market of Chennai displayed modest recovery in the first two-quarters of 2017. While luxury properties grappled for buyers, affordable markets and those along the IT hubs garnered higher interest from developers and buyers. Additionally, unsold inventory is on the decline. South and West Chennai cumulatively remained the prominent housing hubs backed by fresh inventory in the affordable segment and infrastructure projects in pipeline. Falling within Chennai Corporation Limits, Alandur enjoys sound civic amenities such as uninterrupted water supply and electricity and sewage connections. The locality is in proximity to St. Thomas Mount Cantonment, Office Training Academy and Guindy (3 km), a home to several medium and small scale industries. The area also promises close connectivity to IT parks that makes it a good option for tenant community and prospective homebuyers. Alandur is one of the five spots in Chennai that are proposed to be converted into a commercial hub, others being CMBT, Arumbakkam, Ekkattuthangal and Ashok Nagar. The development will include an office space, sprawling over 1.8 lakh sq ft. In close proximity to transport modes, the project will boost ‘walk to work’ culture and decongest roads. Another important project is intermodal transport hub proposed by Cantonment Board. Covering 370 sq ft area, the project will include three air conditioned bus shelters at Asar Ghana junction, nearby metro station. These shelters will be equipped with Automated Teller Machines (ATM), CCTV, security guards, drinking water and coffee vending machines. “Alandur enjoys smooth connectivity via metro rail. The metro station serves as the changeover point for other stations. Passengers heading from Koyambedu towards the airport shift corridors at Alandur metro station. 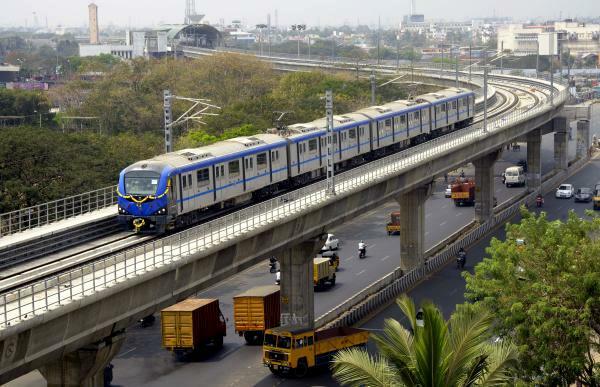 The station also connects Little Mount station with the airport and Koyambedu,” shares Satheesh, a Chennai based property consultant. Alandur also enjoys hassle-free connectivity via St Thomas Railway Station and Kathipara Junction. Besides, there are several state owned buses that ply here and ensure smooth connectivity to other areas of the city. The area boasts of plethora of residential opportunities varying from apartments, villas and independent bungalows. While there are several options for first-time homebuyers and investors, it has also received significant attention from the tenant community. Proximity to IT hubs and industrial estates have ensured buoyancy in the market. Average property rates here range between Rs 6,500 and Rs 7,100 per sq ft. Although, capital prices failed to report significant growth in the last two quarters, they have not reported a fall either. Overall housing market has unfurled stability, reflecting homeowners’ reluctance to reduce “ask” rates. Rental rates are pegged between Rs 8,000-12,000 per month for 1 BHK units and Rs 14,000-17,000 per month for 2BHK units. Young working professionals patronise the rental demand here. The area also unfurls good supply of residential plots which have witnessed decent price appreciation ever since the inception of the metro project. Identified under Atal Mission for Rejuvenation and Urban Transformation (AMRUT), Alandur’s profile is certain to witness a massive fillip in the times to come. In accordance with several connectivity booster projects on the card, the proposed development under AMRUT would augment area’s basic infrastructure too ensuring 24/7 water supply, storm water drains and development of lung spaces. The anticipated all-round development is definite to shore up realty demand in Alandur and thereby, propel capital prices. Industry stalwarts estimate 10-15 percent hike in residential prices over next five years. Land market would also foresee a massive upswing in capital values.